Time to Try a Townhouse . . .
For many people, the thought of transitioning to Urban Living means giving up many of the things they have become comfortable with in their Suburban Homes. Expansive floor plans, private garages, multiple bedrooms and baths, fireplaces and yards . . . all items that don’t seem to be a part of Condo or High Rise Living. Enter the Townhouse. For those of you who are tried of long commutes, mowing grass, excessive maintenance or rooms left empty by children moving on; Townhouses are the perfect solution. Most have many of the same features found in Single Family Homes, but in a Vertical rather the Horizontal layout. One consideration to Townhouse living is health issues. Since Townhouses are almost always multi-story (the majority have three levels), stairs are viewed as either an asset or liability. Going up and down stairs several times a day is a great cardio workout, but also can be a ‘deal killer’ for those with limited mobility. Townhouses come in many styles, and could be a part of a Condominium or HOA. 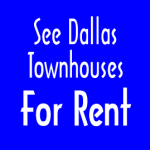 Intown offers a wide variety of Townhouses, For Sale and For Rent, in virtually every neighborhood of Dallas; and across a wide spectrum of style, size, and price. If you are looking for the ‘Carefree’ lifestyle demanded by ‘Busy Professionals’ and on-the-go ‘Empty Nesters’ along with the comforts of a House; then Townhouse living might be an ideal match. 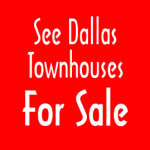 Check out the Listings below to preview some of Dallas’ most desirable Townhouses; and then call an Intown Associate to see first hand.